Read sellers ratings before buying!! We have a perfect 2 year track record! We are selling these at our cost!! We have 4 licenses left from a 200 user IT install today and cannot resell these as retail. You can pay here (1 user) or click on the link above or link option to go direct to our site to view al the details and also add an additional second user at time of purchase for $50.00. Instant Download will be sent in 5 minutes! Medialess download file. You will receive a link and serial or activation instructions within 5-10 minutes of purchase via email from our server. You may save setup file to disk to maintain your own backup copy. 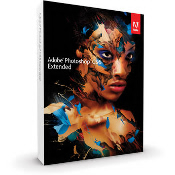 Adobe Photoshop Extended CS6 for Windows is the industry-standard tool for professional digital image editing. Greatly expanded for this CS6 version, the software's tool set now includes a much larger array of 3D tools that let you create 3D artwork using in-context, on-canvas controls for extrusions, editing lights, and more. Photoshop Extended uses a powerful layer-based approach for image editing. Using layers allows you to make adjustments to images without modifying aspects of an original. You can modify layer opacity and order, aiding in compositing tasks. Photoshop keeps track of each change you make to an image, allowing you to undo actions with ease. With CS6 you can now search layers, and use layers to modify vector graphics (adding gradients, for instance) in the same ways you use layers with photographic imagery. Image editing is now accelerated by the Mercury Graphics Engine, which leverages technology from the playback engine that drives the video-editing application Premiere Pro. The Mercury Graphics Engine of Photoshop Extended CS6 powers the blur gallery, the crop tool, 3D rendering, and the Lighting Effects Gallery. Other performance enhancements include background saving, which allows you to continue working while large files are being saved, and auto-recovery, which automatically saves your work every 10 minutes to safeguard it against any system crashes. Of course Photoshop Extended CS6 includes all the familiar features that you've come to expect from this ubiquitous program, including HDR image creation, color-correction tools, support for a broad range of file types including RAW images, and 2D & 3D compositing. Tightly integrated with Adobe Lightroom, Photoshop Extended is a must-have program for any serious photographer, designer, or digital artist. Please Note:Mobile and tablet applications require a separate download and agreement to additional terms. Such applications may not be available in all countries or languages and may be subject to change or discontinuation without notice. Additional fees or subscription charges may apply.